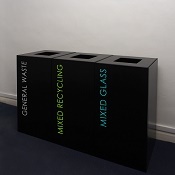 A very stylish and practical range of office recycling bins/waste bins that will not look out of place in many interiors. Available in a 50 litre and 100 litre square or rounded detail with a choice of top cutouts. 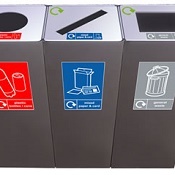 Standard colour is silver but call us to discuss customising the recycling bins with marking material and colour choices. Also incorporates a bag holder for easy emptying. 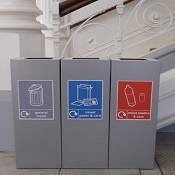 Recycling can only start when the waste has been separated into its components. This is best carried out at source before handing over to the collection contractor. Different collectors or Councils have different grouping and so recycling waste streams will vary from location to location. That is why we offer a service to provide the graphics to suit the waste streams required either by the collector or the client. It is important also to give a clear message to exactly what waste goes in which bin. This is why the tops can be provided with different shaped apertures to mirror the type of waste and reinforce that message. We can provide a slot for paper, a round aperture for bottles and cans, or a square aperture for general waste. It is possible to use square apertures for all types if required. A locking model is available for confidential papers. The price of the Sorting recycling range includes the cost of standard WRAP convention graphics. This is specified at time of ordering and is provided with the specified grouping using WRAP colours and icons. We are also able to design your graphics to suit any style and combination or grouping. We can work to your artwork and chosen language. 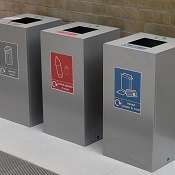 Sorting recycling bins are manufactured in high grade steel and finished in polyester and epoxy powder coat to a large range of colours. The standard colour is Silver and this is the colour available from stock. Each bin has 4 sturdy riveted white rubber feet to protect the most delicate floor coverings. Contact us and we will be pleased to discussed your recycling requirements.